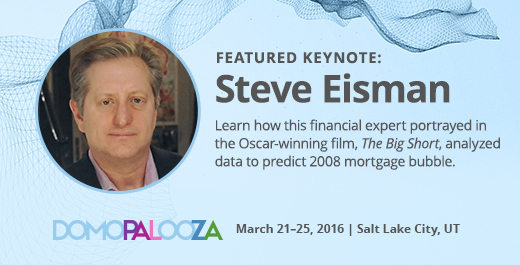 SILICON SLOPES, Utah – March 2, 2016 – Today Domo announced that financial manager Steve Eisman, the inspiration for Mark Baum, Steve Carell’s character in the Oscar-winning film “The Big Short,” will give a keynote speech at Domopalooza on how he analyzed data to uncover significant truths about the 2008 housing crisis and was able to reap substantial benefits. The film won at this year’s Academy Awards for Best Adapted Screenplay and was up for five Oscars in total including Best Picture. Eisman managed hedge funds for FrontPoint Partners, where he bet against subprime mortgages (as depicted in the film, based on the Michael Lewis novel of the same name). He now works as managing director for the Eisman Group within the Neuberger Berman Group. Domopalooza, Domo’s annual customer event, is designed to educate, inform and inspire Domo’s fast-growing community of users from the world’s most progressive organizations and most recognizable brands. Now in its second year, Domopalooza is being held March 21-23 in Salt Lake City. Event attendees will gain new insights on how to best leverage Domo, their growing universe of business data and industry best practices to operate more efficiently and effectively to improve business results. In 2015, Domopalooza attracted more than 1,300 attendees who were director-level and above across organizations ranging from mid-sized corporations to worldwide enterprises. Domo anticipates that number to grow to 2,000 senior-level attendees this year. To register and stay up-to-date on Domopalooza, visit Domopalooza’s event page. Domo is a cloud-based business management platform that transforms the way business is run. Domo gives CEOs and decision makers across the organization the confidence to make faster, more effective decisions and improve business results by giving them one place to easily access all the information they need. Domo’s founding team consists of some of the most sought after talent in the industry with experience that includes Amazon, American Express, Ancestry.com, eBay, Endeca, Facebook, Google, LinkedIn, MLB.com, Omniture, salesforce.com, SuccessFactors and SAP. For more information, visit www.domo.com. You can also follow Domo on Twitter, Facebook, LinkedIn, Google+, Instagram and Pinterest.